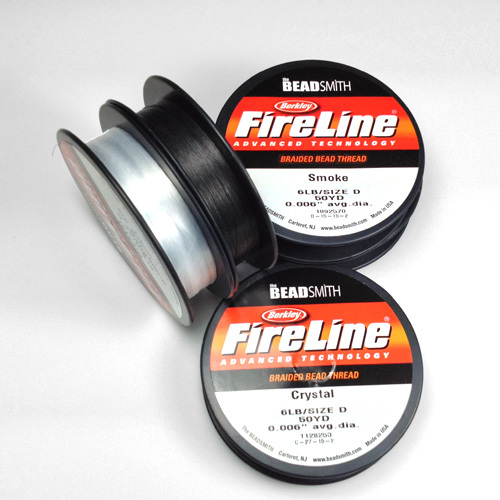 FireLine is made from Dyneema, an ultra high molecular weight polyethylene similar to Spectra. Dyneema is made by DSM in the Netherlands, whereas Spectra by Honeywell in the USA. The FireLine fibers are braided, then coated with a thermally applied bond. The thread has very little stretch and a smooth appearance. It flattens a bit when pushed, can be knotted and is not easily pierced by a needle. It is waterproof, colorfast. The actual fiber are white and cannot be dyed. For Smoke, the bond is dark grey. The thread can be melted with a thread burner. Personal Note - A great option as a beading thread - Check my post on this subject!